Bertha was born 3 August 1897, the daughter of Jacob and Mary (Kessler) Huffman. Samuel and Bertha had only been married seven years when Samuel died on 2 April 1945 near Chatt in Liberty Township, probably at his residence at R.R. #3, Celina. He was 72 years, 8 months, and 10 days old. He died of bronchial pneumonia due to endocarditis according to his death certificate and Zion Chatt’s records. He was interred in the mausoleum on the 5th and Cowen, Ohio City, was in charge of the funeral arrangements. Samuel’s wife Bertha was the informant for his personal information on his death certificate. Samuel was survived by his wife Bertha and his brother Edward. Samuel A. Bollenbacher; Chattanooga, Apr 4—Funeral services will be conducted Thursday at 2:30 p.m. for Samuel A. Bollenbacher, 72, of near Chattanooga, who died Monday at his home in Liberty-tps from a cerebral hemorrhage. Surviving are the widow, Bertha, and one brother, Ed of Portland, Ind. Samuel’s widow Bertha died 3 June 1977 in Coldwater, Mercer County, Ohio. 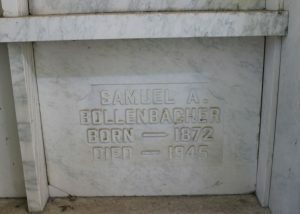 She is buried next to Samuel in the Chattanooga Mausoleum. “Ohio, County Births, 1841-2003,” database with images, FamilySerach.org, Samuel Bollenbaugher, 22 Jul 1872; Liberty, Mercer County Births, Vol. 1, p.88; FHL microfilm 914953. 1880 U.S. Census, Liberty, Mercer, Ohio, ED 188, p.474C, dwelling 52, family 55, George J Bollenbacher; Ancestry.com; FHL microfilm 1255048, Nara microfilm T9, roll 1048. 1900 U.S. Census, Liberty, Mercer, Ohio, ED 85, p.11B, dwelling 217, family 223, George Bollenbacher; Ancestry.com; FHL microfilm 1241304, NARA microfilm T623, roll. 1304. 1910 U.S. Census, Liberty, Mercer, Ohio, ED 119, p.11B, dwelling 208, family 215, George Bollenbacher; Ancestry.com; FHL microfilm 1375227, NARA microfilm T624, roll 1214. 1920 U.S. Census, Liberty, Mercer, Ohio, ED 140, p.9B, dwelling 183, family 197, George E Bollenbacher; Ancestry.com; NARA microfilm T625, roll 1418. 1930 U.S. Census, Liberty, Mercer, Ohio, ED 20, p.4A, dwelling & family 79, Samuel Bollenbacher; Ancestry.com; FHL microfilm 2341584, NARA microfilm T626, roll. 1850. “Ohio Deaths, 1908-1953,” database with images, FamilySearch.org, Samuel A Bolenbacker, 2 Apr 1945; FHL microfilm 2372736. 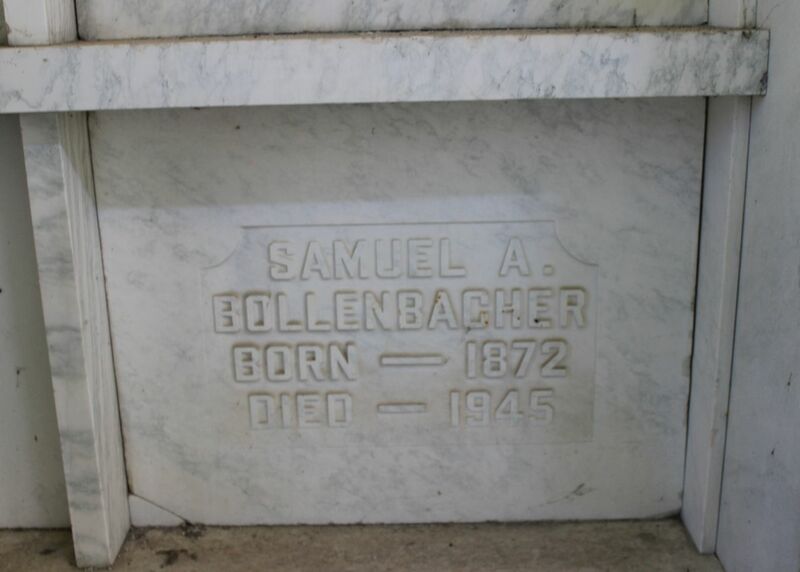 Samuel Abraham Bollenbacher obituary, The Lima News, 4 April 1945, p.4 Lima News; digital image, Ancestry.com.